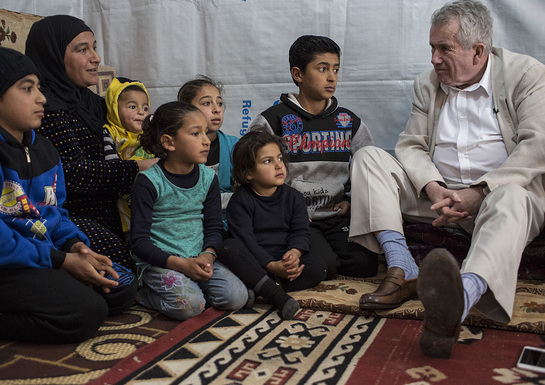 Martin Bell, veteran BBC reporter and UNICEF UK ambassador, visited Lebanon’s Bekaa Valley where he witnessed first-hand the situation for Syrian children trying to rebuild their lives. Martin, who last reported from Lebanon in 1973 just before civil war broke out, saw how children have paid the heaviest price in this six-year war. Today, one in four people in the country is a refugee, the highest proportion per capita in the world. Inside Syria, suffering hit rock bottom last year in a drastic escalation of violence. With grave violations against children at their highest level on record, 2016 was the worst year for children in Syria. At least 652 children were killed – a 20 per cent increase from 2015. Martin made the journey to Lebanon with Unicef, the world’s leading children’s organisation and one of the agencies operating both in Syria and its neighbouring countries. During his visit to the Bekaa Valley, he witnessed how Unicef is supporting families that have fled Syria, providing them with safe drinking water, child protection services, education and healthcare. Many of the people he met fled Aleppo and Raqqa because of indiscriminant shelling and violence which tore families apart. Syrian families face many challenges in Lebanon; some are not able to send their children to school, refugees have not officially allowed to work (making them dependent on international aid), and children are being pushed into the workforce far too young, often in low paying and hazardous jobs or by begging. “One boy I met described how he fled from Raqqa six months ago with his mother and five brothers and sisters. His father had been taken away, murdered,” recalled Martin. “Right now, the world is facing an unprecedented refugee crisis and we must do more to protect the extraordinary number of children who have been torn from their homes by violent conflict,” he added. Ensuring all Syrian children have access to the education and protection they so rightly deserve is the first step on the journey to recovery and rebuilding childhood. After six years of war, nearly 6 million children now depend on humanitarian assistance, a twelve-fold increase from 2012. Millions of children have been displaced, some up to seven times. Over 2.3 million children are now living as refugees in Turkey, Lebanon, Jordan, Egypt and Iraq. On behalf of the children of Syria, Unicef is appealing to all parties to the conflict, those who have influence over them, the international community and anyone who cares about children for an immediate political solution to end the conflict in Syria and sustainable support for vulnerable children, regardless of their status.